Madeline Ziegler, 26, of Crown Heights, on bringing “one of the greatest nights” of her life from Boston to Brooklyn: allowing strangers a safe space to cut the mindless chit chat and start talking about things that really matter. Sara: What is skip the small talk? 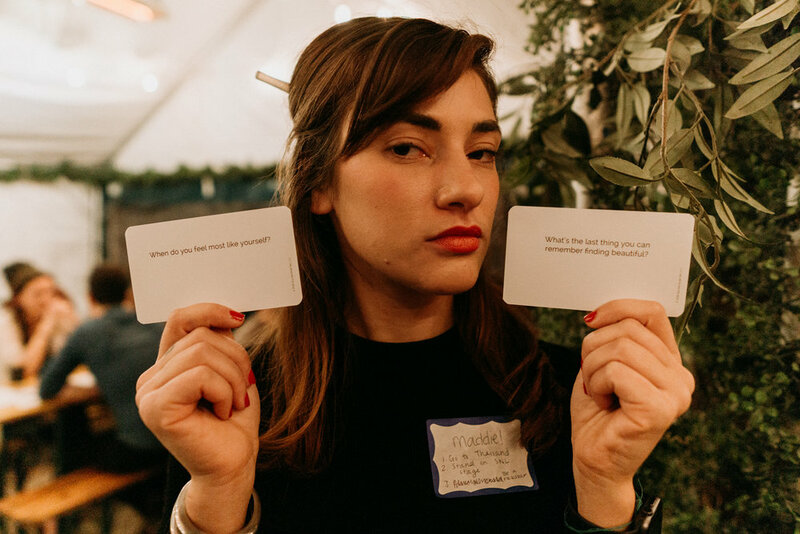 Madeline: Skip the small talk is an event where people can come to meet other people and discuss topics about themselves that they would not discuss normally with strangers. It’s a great way for people to meet other people, to get things off of their chests and just make connections with other people. It started as an idea from the creator, Ashley Kirsner, who wanted a way for people to connect to each other. She came up with the idea to make this event and over time she kind of curated it to what it is now. She created the questions, she made cards, and she developed the format, which is what it is today. To break the ice, participants are asked to write three things from their bucket list on their name tag. Michael’s “climb El Cap” “spend a month in ‘eternal night’” and “do a planche” are just some examples of the amazing things Brooklynites want to do before they die. I got involved because I was working at a brewery that hosted Skip The Small Talk in Boston. I had heard about it and I was interested in going, but I was usually working on the nights it was being hosted, so when I quit the brewery before I moved to New York I attend a Skip The Small talk and I loved it so much, and had the best time. Afterwards I went up to the creator, Ashley, and I said “This was one of the greatest nights of my life, but I’m moving to Brooklyn in a week and I really think this would work well there is it okay for me to bring it to New York?” and she said “I’ve actually been wanting to bring it to New York and I didn’t know how I would have the time to do that (because she’s very busy) so she said “as long as you are willing to put in the effort to find a space, and eventually host it yourself that’s totally fine and I am fully behind you”. I’ve been involved since September. The first Skip The Small Talk in Brooklyn was hosted in September. Ashley hosted it and I was the door-person and the past two times I’ve hosted it. Genuine communication as a hallmark of Skip The Small Talk helps participants get to know each other and feel more comfortable opening up right off the bat. What do you think people get out of it? I think it gives people a space to speak to other people on a more personal level and in a safer capacity because everybody there is on the same page and they’re all there to talk to other people. It takes out the awkward aspects of meeting a stranger, and talking to them and also it gives them an opportunity to express themselves in a way I think not a lot of people are used to on a daily basis. You said that your first Skip The Small Talk was the best time of your life, what kind of experience did you have your first time? So I went in not knowing too much about it and I just thought it looked cool and I was pretty unaware of what I was getting myself into and then once I started having conversations with people I was thrilled because, first of all, I love talking about myself, and I love hearing other people talk about themselves so it was a pretty perfect scenario for me and I made some friends which was really fun and I just was smiling the entire night and had a really great time. People come to skip the small talk if they’re looking to make meaningful connections with other people, maybe they have a hard time making friends and they’re looking to find other people who are looking to make friends. It’s a space for people who just want to have conversations with other people. 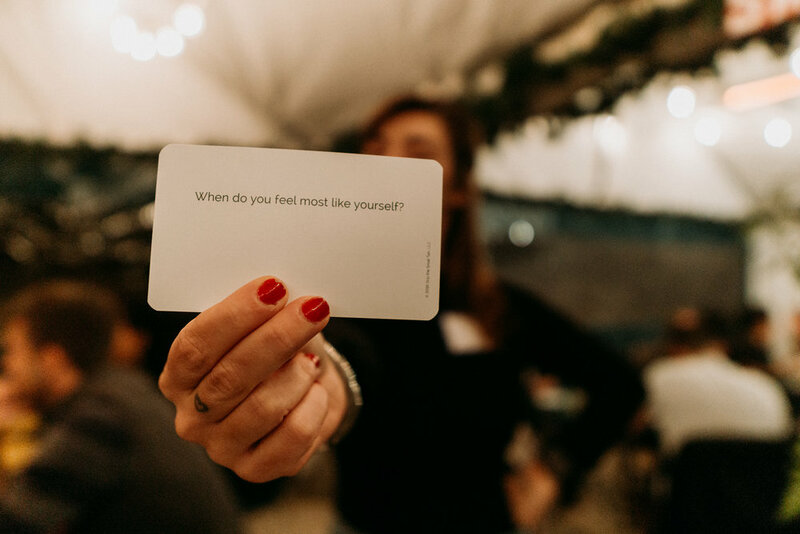 Question cards written by Ashley Kirsner give prompts for participants to delve into more personal questions they wouldn’t typically ask someone they just met. Do you think making friends in New York is difficult? Absolutely. I think it’s something almost everybody struggles with, especially people in their 20’s who I have spoken to struggle with it. It’s really challenging to stop people for long enough to have a conversation because everybody is really busy and not a lot a lot of people are confident enough to have a conversation with other people. It’s just really tricky in general to make friends as an adult. What kind of plans do you have in the future for Skip The Small Talk? In the future, I would love to expand to a bigger space which is happening within the next few months. I would also love to expand to more boroughs. I would love to take it to Manhattan because I think it would do really well there. I would love to do it as many days a week as I can fit into my schedule because I really enjoy doing it and I would really like to get better, and I think the more people who get to experience it the better. Participants discuss questions during the group portion of Skip The Small Talk. What got you interested in your first Skip The Small Talk you attended? I just had seen it happen, I walked by it so many times and I kind of heard what was going on but didn’t really understand what was happening and I knew that it was about talking to people and I also hate small talk so anything that is against small talk is right up my alley. I was all for it. You have a mental health background, right? Yes, I do, I have a history of mental illness and also a history of studying mental health and wellness. Do you think that influences why you like Skip the Small Talk? I think a lot of it has to do with the fact I like talking to people and I think it’s very therapeutic to talk about things you might be going through. I think it’s also just generally therapeutic to talk to other people, so I think it creates a really nice space for that. A lot of the time people will go and they’ll talk about things they’re struggling with that they couldn’t possibly talk to other people about and then they get to talk about it with a stranger and then they never have to see that person again, so it’s like a mini version of therapy where you get to talk out your problems with another person, and maybe you don’t have any problems and you just want to talk to another person and that’s also great. Two participants share a laugh during one of the rounds of Skip The Small Talk. Although most of the questions are serious, there’s no lack of a sense of humor sharing things about your life. And I guess it helps people not feel so alone, right? Exactly, yeah, it’s a great way for connection.